"Women encouraging women... It's a WONDERFUL thing!" ﻿Once a month we gather at a local restaurant, enjoy our soup, salad, and other delectable items, and just enjoy sharing and encouraging each other. We are learning to grow from our experiences, use our stories to help others, and to embrace our uniqueness as individual, distinct vessels who were designed for a purpose and destiny. We are inter-generational, from different backgrounds, have had different experiences, and are from different churches. Our common thread is our love for the Father and a desire to live our lives to the fullest, as we believe He intended for us to live. For the past four years we have met in Jacksonville, FL. Those meetings will continue. However, we are excited to announce that in 2015 we will be on the road and meet once a month in nearby Hilliard, FL, taking the encouragement, empowerment, and equipping message and tools to God's Daughters in another city. We will now have﻿ Gathering of the Vessels - Jax Edition and Gathering of the Vessels - Hilliard Edition ﻿We are hoping to add other cities and venues to the itinerary, including two and three day seminars that will help sisters every where break free, break out, and break through to become the awesome vessels that God intends for them to be! I arrived thinking I was there to facilitate a Q & A session on the program only to find out that I was there for a segment called "The Mama Lott Show" instead! What?! But you know I had a blast! It is amazing what happens when we just simply let God out of the box and allow Him to reach people through non-traditional means. Holy Spirit ministered to His daughters! Whew! God is just simply amazing! What a surprise to get to this long anticipated event and find that the ad I placed in the program was there with an added honor on the bottom! How humbling to receive the SHINE Award for simply doing what I do -- ENCOURAGE OTHERS!! I know that Monica's message is much needed and will take her far. I have to continue to encourage her. You know my motto, "Women encouraging women... It's a WONDERFUL thing!" I am looking forward to August 2014 and our next Ultimate Girlfriend Experience!! It's going to be EPIC!! What an awesome time it was at this women's conference! I was blessed to have the opportunity not only to participate but also to partake and receive what God was speaking and imparting into the lives of His daughters. My life was enhanced beyond words! 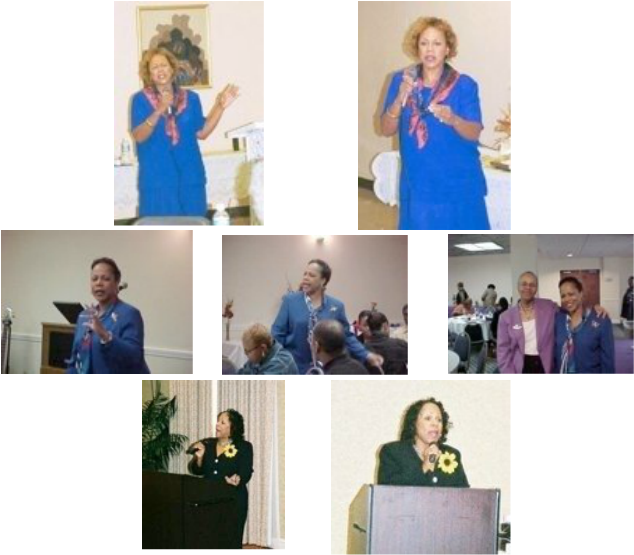 These are pictures taken during times of ministry at the Nikao News, Intl., Vision and Destiny Conferences in 2002, 2005, and 2006. Visionary, Angela Renee Bell, is an awesome woman of God who thrives on pushing others to pursue and realize their God-given visions and dreams. Her conferences were held in the metro-Atlanta area. She is the founder and editor of the online publication, Nikao News Online. Check out her website at http://www.nikaonews.com/ and get encouraged, too!